In April of 2007, a Northeastern Student went to a bar near the Massachusetts campus. According to Boston.com, tragically, the 21-year-old young student fell down the basement staircase at the bar, suffering a severe head injury that led to his death two days later. The family of the young man filed a wrongful death lawsuit against the bar and the owners were found not liable. A judge, however, ordered the owners of the bar to pay $6.7 million in damages to the family of the deceased student. The judge issued the order based on the bar’s violation of state consumer protection laws. While the case is still being appealed, our Boston personal injury attorneys want to remind property owners that it is always better to be safe than sorry. We urge compliance with all consumer protection laws and we recommend that both property owners AND patrons take responsibility for avoiding a potentially deadly fall. In the case of the 21-year-old Northeastern student, the bar owners indicated that the injured student had not had permission to be on the stairs, which were in a private part of the building used by employees and not open to patrons. However, others testified that the owners of the bar and the managers were well aware that customers seeking a quiet place to talk on their cell phones routinely went into the area close to the stairs. The stairs, however, present a very obvious danger. The stairs were built in the 1980s and they went from the kitchen to a downstairs basement where kegs of beer and other bar or restaurant supplies are kept. There were colored vinyl strips at the top of the stairs but there was no door because employees needed to be able to carry supplies up from below. Employees who used the stairs regularly repeatedly told managers that the steps were dangerous. The stairs had not been rebuilt or changed by the restaurant owners, who allegedly ignored the warnings. The judge who awarded the damages indicated that it was plainly obvious that the steps were very dangerous and an accident waiting to happen. The judge also indicated that the staircase clearly wasn’t compliant with the building codes, and that the vinyl on the top of the steps obscured the young student’s view. Further, the stairs were lacking a required top landing and a required second railing. 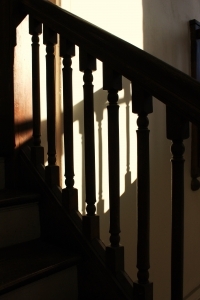 Because the stairs were so dangerous, the bar owners were required to pay damages despite the fact that the young student who was killed had a blood alcohol content (BAC) more than twice the legal limit. The judge acknowledged that the student was under the influence but put forth the position that the student was a heavy drinker with a high tolerance who wasn’t experiencing typical signs of intoxication. Although the case is being appealed, it serves as an important reminder that property owners or occupiers have an obligation to their patrons to follow all building codes and consumer protection laws. If they fail, they may face a lawsuit and significant legal liability. This may be true even if the consumer protection violation is in an ostensibly private area of the bar, if the restaurant managers are aware that patrons are using that space. If you or a loved one has suffered a premises liability injury in the Greater Boston area, contact the personal injury attorneys at the Law Offices of Jeffrey S. Glassman, LLC for a free consultation to discuss your claim. Call 1-877-617-5333.